Tom Mostyn (1864-1930) was born in Liverpool, son of Edwin Mostyn - an artist. He studied at the Manchester Academy of Fine Arts, where he won first prize for life drawing under Herkomer at Bushey. 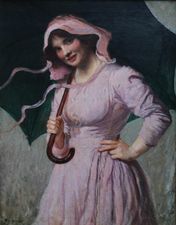 Exhibited at the Royal Academy from 1891, around Britain and abroad in the Paris Salon and in Carnegie Institute, Pittsburgh. After World War I Mostyn moved to Devon and began painting enchanted garden scenes for which he would become best known. His work is represented in many public collections.